Right off the bat, a young representative from the local chapter of ANSWER, the group that organized this Anti-War demonstration, approached us and told us that we would have to take our banners to the back of the march. Bruno Bruhwiler from WeAreChangeLA immediately confronted him about trying to kick us to the back of the bus. The young man said that ANSWER has the permit for the march, and they can tell us what to do. Bruno reminded him that they do not have a permit to trespass on our Freedom of Speech, and went on to advise the young man to go back and tell his team that they do not want to incur the liability for trespassing on our First Amendment Rights. He walked away after warning us that we would have to deal with the Police. It wasnt long before he came back with four more gentlemen, one of whom began barking at us about a mish mash of reasons why we had to go to the back of the march, and Bruno explained to him why we did not. "Was I done talking?! Dont interrupt me! I am not done talking," the agitated man barked. Bruno says. "We dont really want to hear what you have to say." One of the gentleman said to us that our message is not conducive to the message of the march, so Bruno asked them all "What reason did Obama give for the wars in Iraq, Afghanistan, Pakistan and Yemen?" "We dont want to have a conversation about this." "The reason he gave was because of 9-11! Our message is THE anti-war message. There is no message that is more important to the anti-war movement than 9-11 Truth." You could see what looked almost like shame on their faces, as they had nothing to say in dispute. Bruno alerts them, "I need to see IDs from everyone. As far as we know you could be anybody off the sidewalk. How do we know you are actually the organizers?" They refused to show IDs, and instead began stating their names, one of which is Jim Lafferty. "Jim Lafferty!" exclaims Bruno with a smile. Jim Lafferty is the president of the Lawyers Guild in Los Angeles, and also one of the primary aholes at the local radio station, KPFK, who has been instrumental in pushing 9-11 Truth out of the programming over the past couple of years. "Jim, are you prepared to incur the liability for trespassing on our First Amendment Rights, today?" Jim had absolutely nothing to say, and began taking steps back and turning away. That left 2 gentleman with us, one of whom was quite level headed. The other seemed no older than 20, wearing an orange vest, who apparently was the head of security. He said to Bruno something along lines of "We are not violating your rights, this is our march." Bruno corrected him, "Just by talking only to us, and not everyone else here today, you violated our Constitutional rights because you picked us out for our message." "Well, you will have to deal with the police," he says to us. "Great! Send them over. We talk to the police all the time. We love them, and they love us." Needless to say, not one police officer confronted us the whole day. Watch the YouTube video, and you will see that our participation in the march was an extreme success. Nelson Martias made a genius move by having a table at the beginning of the march where he handed out 911 Truth signs, and stapled them to sticks, back to back. He even stapled the signs to the sticks of other signs, so folks who came with one group or another, added 9-11 Truth to their message. 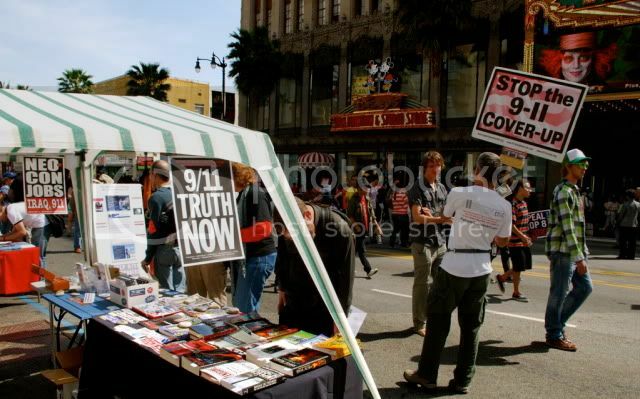 Throughout the march, everywhere we looked, we saw people carrying those 9-11 Truth signs! We also passed out all of our brochures and cards from ae911truth.org. Those went really fast. Folks love 'em. One final note, Cheryl Gaskill came up with the message, "9-11: What you dont know is killing people" a couple of years ago at our brainstorming meeting for the banners. It turned out to be a very humble but effective message for outreach. We get lots of compliments for that one. My sense is that the mainstream anit-war movement is very much under the control of TPTB. Anti-war is seen as a natural response to a war, and protesting the war is all red-white-and-blue exercise of free speech. It's also pointless if we don't challenge the premise upon which the justification for war is based. Most of the people in the anti-war movement are not going to be shilling for the 9/11 OCT. OTOH, there are probably some assigned "COINTELPRO" gatekeepers who will attempt to keep 9/11 Truth out. Getting the message to the rank and file of the anti-war movement will certainly benefit 9/11 Truth by reaching people who are inclined to oppose the status quo. Kerberos on Sun, 03/28/2010 - 2:43pm. bbruhwiler8 on Sun, 03/28/2010 - 11:31pm. This 4 minute clip is a good dissemination piece. Thanks! Almost like a news report, this video comes off with some great aspects (such as a quickie education on Building 7 and showing many people on the side of 9/11 Truth). TomT on Mon, 03/29/2010 - 4:49am. TomT on Mon, 03/29/2010 - 5:16am. Randy on Mon, 03/29/2010 - 2:23pm. Your natural confidence and your fearlessness speaks volumes to everyone. Thankyou again and again! Lillyann on Mon, 03/29/2010 - 3:10pm. As usual, WACLA has set the bar pretty high. Bravo. If we all had the same determination and commitment as WACLA, there would be only one "Peace Movement," and 911Truth would be leading it. Steve and the video crew did another amazing job. LOVE the aerial shots. You folks have all the bases covered. I'm always impressed with your actions. WACLA rules -- Peace wins. 911Peacenik on Sun, 03/28/2010 - 2:48pm. I darned near started to cry. Amazing job. We are so lucky to have such fine people among us, such talented ones. Absolutely beautiful! blubonnet on Sun, 03/28/2010 - 3:03pm. I did start bawling over that video - SO PROUD! Thank you so much for all involved. God Bless. Robert Rice on Sun, 03/28/2010 - 3:43pm. It takes guts to do that, and you did it so well! John Bursill on Mon, 03/29/2010 - 8:38pm. "Our message is THE anti-war message...."
"...There is no message that is more important to the anti-war movement than 9-11 Truth...."
TomT on Sun, 03/28/2010 - 3:15pm. DavidS on Sun, 03/28/2010 - 4:58pm. Way to stand your ground WACLA! I am so proud of you guys. We are fortunate to have such a great group representing our cause in one of the most important cities in the world. ROBinDALLAS on Sun, 03/28/2010 - 5:01pm. Way to fight for it! We are change LA is great. & 9.11 IS THE ANTI-WAR'S NO#1 MESSAGE.. let's get real. truthoverprofit on Sun, 03/28/2010 - 5:42pm. Another great job by WeAreChangeLA. Flicker on Sun, 03/28/2010 - 5:47pm. And the video is very moving. Let's spread it too. The example has been set. Now more of the same! Vesa on Sun, 03/28/2010 - 5:59pm. It was great seeing this. Kevin Ryan on Sun, 03/28/2010 - 7:34pm. That is the BEST I've seen. 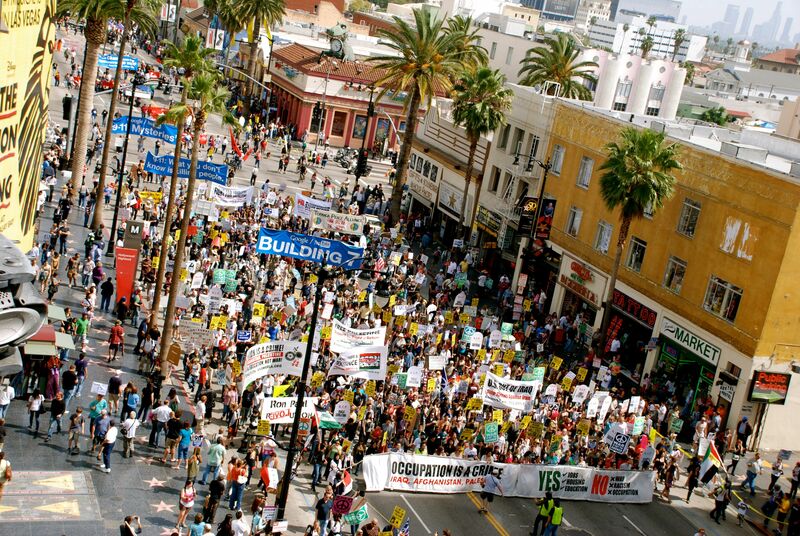 Maybe next time Film Artists with Conscience for 9/11 Truth will lead the march. Joe on Sun, 03/28/2010 - 7:58pm. I'm out on the streets Tomorrow! Still got tears in my eyes from this video.. Thank WACLA...from the bottom of my heart. You warmed my day and gave me hope to go on. darkbeforedawn on Sun, 03/28/2010 - 8:09pm. It's clear that HUGE signs are KEY. Flag Holsters: If possible, I'd advise groups using mega-signs to use flag holsters. These babies wrap around the waist and have a "cup' in front to help hold the pole(s) in place so that can be held even higher. Vid. background music: Very effective, Very poignant. Mokeyboy on Sun, 03/28/2010 - 10:00pm. Great effort by We Are Change LA - and the banners are scientifically correct color wise. The blue chosen will be relaxing for people who look at it, and there's the additional element that the blue is patriotic. Such a brilliant effort by all. marzi on Mon, 03/29/2010 - 6:47am. ... why they looked so good! This is valuable information that should be utilized in the future. I agree that size, too, matters here. The banners dominated the scene. I was wondering if "9-11 Mysteries" was the best choice for a film to promote. It's a good film, which I co-translated into Finnish, but it's a bit old now. Vesa on Mon, 03/29/2010 - 1:21pm. First, thanks to everybody here for the accolades and encouragement. Our participation in the march was such an intense rewarding experience. It's exhilarating. We encourage everyone to take it step by step, event by event, and you will get more comfortable and confident with experience. Our strategies on how to go about such an event have evolved over time simply by just getting out there and doing it. I do want to stress that it takes team work. Every single living soul holding those banners makes all the difference. Katy Kurtzman has played such an integral role in the design, maintenance and use of these banners. Unfortunately her beloved cat took seriously ill the morning of this march, and she could not participate. The primary reason to use blue is that no matter where you are, and no matter what the weather is like, the blue will stand out against everything around it. Technically speaking, blue is also the least obtrusive color to the eyes. The size of the banners and the simplicity of the message makes comprehension very quick for all those who only have a chance to see it for a couple of seconds (like folks driving by). Having five or more people holding those poles adds tremendously to the impression. The typeset quality of the letters keeps the audience from dismissing us as some 'radical fringe' group. If anybody wants detailed information about how to have these banners made, please contact me directly, let me know who you are, and I will provide all the info plus digital files with artwork. I will help you create new artwork if needed. On a day with no wind, you just need three people holding a banner, and you will have more impact than 50 people holding little signs, because everybody will comprehend the message quickly and from a distance. bbruhwiler8 on Mon, 03/29/2010 - 3:47pm. April 11th is our 2 year anniversary of our first banner on an overpass. bbruhwiler8 on Wed, 03/31/2010 - 1:26am. Our S.F. /East Bay (N. Cal Truth Alliance) group plan to follow suit with the style and message of your banners, since they are so effective. There is little point to reinvent the wheel here. You clearly got it right! 7man on Mon, 03/29/2010 - 2:58pm. When everything else has gone bad, you have lifted me up and given me hope. Chris Sarns on Sun, 03/28/2010 - 11:59pm. @ cnn.com on Obama's Afghanistan War. Robert Rice on Mon, 03/29/2010 - 1:15am. The truth movement as a whole is generally very intelligent, well read, and very caring. Let WAC be an inspiration to get out from behind your computers and show the world what the truth movement is about! We are peaceful, honest, truthful, caring, intelligent, empathic. We are ethical and understand and stand up for our rights. Be the change you want to see in the world. Lips Malloy on Mon, 03/29/2010 - 1:54am. You guys and gals are LEGENDS over there in LA! Keep up the great work. Peace from Vancouver. TheParadigmShift on Mon, 03/29/2010 - 2:25am. Congratulations and HUGE "Thank You" for that inspiring and moving display. NYCGuy on Mon, 03/29/2010 - 1:13pm. What can one say? It went straight to the heart. zmzmzm on Mon, 03/29/2010 - 2:27pm. Where did you get the signs though? Were they expensive? Mekt_Ranzz on Mon, 03/29/2010 - 2:57pm. ... the first banners were donated by a certain 9/11 documentary filmmaker who is banned from 9/11 Blogger, strangely enough and sad. Randy on Mon, 03/29/2010 - 3:50pm. bbruhwiler8 on Mon, 03/29/2010 - 4:12pm.